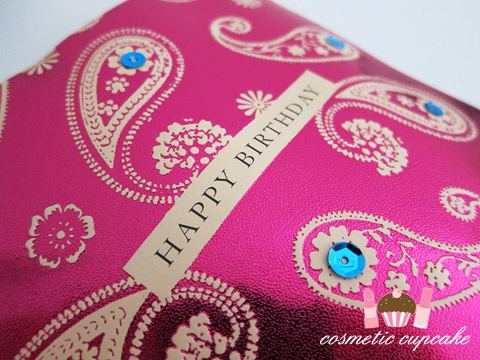 Cosmetic Cupcake: A surprise birthday package! I got home today tired and hungry and found a package waiting for me from the UK. This instantly perked me up as I didn't order anything from the UK, so who was sending me stuff? I didn't ponder the mystery for very long and tore into the package! I almost cried as it was a sweet and totally unexpected birthday package from beautiful Aysh!!!! 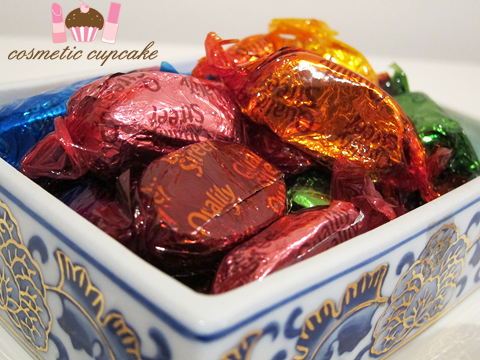 Look at all those chocolates!! 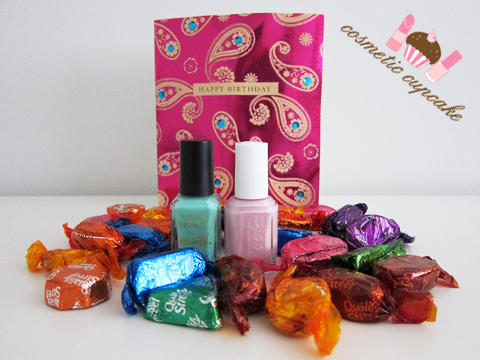 Plus 2 beautiful polishes and a lovely card omgish! Aysh sent me another bottle of Barry M Mint Green (you might remember it unfortunately didn't make it in the last awesome package she sent me) and also Essie Neo Whimsical both now crossed off my wishlist! Aysh you are soooooo naughty for spoiling me!! Thank you so very very much for this wonderful surprise lovely <3 You made my week and I am so appreciative of your generosity =) I am always amazed and overwhelmed at the generosity of my fellow bloggers, you ladies are so awesome! Hi! Nice post and cool blog! I have just discovered it and I follow you! If you like street style I'm sure you'll like Mes Voyages à Paris! Those colors are sooooooo kute!! What an expected surprise and a great way to be greeted at home after a long, hard day. Awesome! Luckily Mint Green survived the trip this time ..have fun swatching it, it's really a beautiful pastel colour! Aw, such a sweet gesture! Those shades are so beautiful and creamy looking. Such pretty shades! It's wonderful that Mint Green survived this time. And I can't wait to see how the inspiration from the card translates into nail art; no doubt it will be beautiful, knowing you! What a pleasant surprise. ^^ Loving those two colors she sent ya! How sweet! Those are great polish colors! @serena_nuvola: I love pastel pinks and greens so I am over the moon with my gift! @Lydiane Gaborieau: Swapping is SO much fun, I really recommend asking some bloggers if they'd be interested in swapping! @Chris: All nail mail is awesome but this was just so much extra special! It was definitely a fantastic way to be greeted! @Kayleigh: It was definitely a relief for both of us! @Alex: Aysh and I were both relieved it made it ok =) Those darn mail people! @JuLiAnnE: I am so touched by her sweet gesture =) Bloggers are awesome! @Aysh: Me too! Those darn mail people should be fired >=( I love the polishes and choccies, can't thank you enough!! @Angela: Pastels are my favourites and these look so gorgeous in the bottle. Can't wait to try them out! @Danielle: Awwww you are so sweet Danielle! =) Inspired manicures are always fun to do. @tiffyama: I love them too! It was such a wonderful surprise to come home too. @Alice: They would go fantastic together I think! Pastels are always so pretty hehe.